In SQL Server Reporting Services (SSRS) you have access to a whole range of built-in functions. 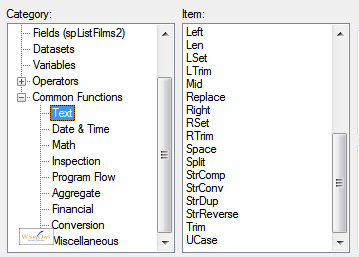 However, to release the full power of SSRS you'll need to create custom assemblies. This rather long blog will explain how - and why - you might do this! The LCase and UCase functions convert text to lower and upper case, but neither capitalises a word. Embedded code is hard to read, limited to a single report and VB-specific. However, the best solution is to create a function in VB (or C#), compile this into something called a DLL file and then reference this within your report. This is called a custom assembly. Portability Code that you embed within one report is obviously not available for other reports to use, whereas you can reference a custom assembly from any report. Error-checking When you type code into the Report Properties dialog box there's no way of knowing whether you've made any syntactical mistakes until you try to run it, whereas custom assemblies provide full Intellisense and code formatting. Languages You can write custom assemblies in either VB or C#. Speed It's not usually a big issue, but code in a custom assembly can be pre-compiled, and so will run more quickly. Debugging You can debug code using a custom assembly. Create a project, class and function. Build, deploy and reference your DLL. Use the custom assembly within a report. Deploy your project (perhaps automatically, using post-build events). Learn how to debug a custom assembly. Let's begin by creating a project, class and function in Visual Studio. This blog assumes that you already know basic programming in either VB or C# (examples are given for both languages).